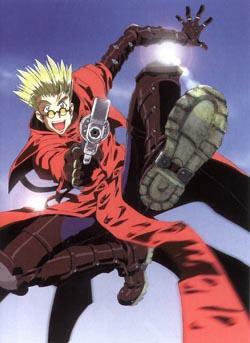 Vash the Stampede, the Humanoid Typhoon. Wanted for the destruction of several cites and towns. The blood thirsty killer without mercy.... or a least that's what people say. When the episode starts out we are introduces to the main characters of the story. First of all is Vash. Of unlike his reputation is a lovable kinda dorky clown. Who is on the run from a gang of Bounty Hunters out for the $$60,000,000,000 bounty on Vash's head. Meanwhile two women, (Merly Stryfe and Milly Thompson) from an insurance agency are searching for Vash's wear abouts. There mission is to keep Vash under a 24 hour surveillance to protect the financial security of the agency. On the run from a over sized bounty hunter named Descartes and his gang, Vash finds him self in a tight pinch and is captured. Meanwhile Merly Stryfe and Milly Thompson arrive on the scene mistaking Descartes for Vash. Things getting even weirder as a nether bounty hunters named Loose Ruth also mistakes Descartes for Vash. With in seconds there is a shoot out between the rival bounty hunters. Meanwhile Merly, Milly, and the real Vash the Stampede escape and start running towards the city of Felnal. Halfway to Felnal Merly and Milly turn back to do there job and watch after the man they think is Vash the Stampede. When they get back they find out that the bounty hunters have joined forces to capture the real Vash. Taking no risks the bounty hunters up the insurance girls before they start to search for Vash once again. There search doesn't take long for Vash the Stampede, the Humanoid Typhoon make's his entrench to save the girls. After an odd battle, both of the bounty hunters lay dazed, confused and beaten by the Vash the Stampede, the $$60,000,000,000 man. But while Vash give a victory's thumbs up to Merly and Milly one of Loose Ruth's bombs explodes creating a land slide that destroys the town Felnal. (luckily the town's people left shortly after the fighting broke out) Both amazed and disgusted by the luck and stupidity of the fight Merly Stryfe refuses to believe that the man who save them is the legendary Vash the Stampede. So Merly and Milly go on there way to find the real Vash why Vash himself walks away in to the sunset. Dr. Yoshi- I thought this was a great way to start the series. It introduces are three main characters Vash, Merly and Milly and set us up with some quick questions. The hero is hilarious, and shows some hint of hidden skill in his fight with the bounty hunters. No main villain is shown, but that's a another point. All in all a great episode.